Sew what's cooking with Joan! : I love lemon's! Lemon Souffle Cake! Lemon Souffle Cake~ this is "KILLER"! Sometimes recipes come from the strangest, most unexpected places. They can come from a flash of creativity connected to absolutely nothing, they can be inspired by eating something amazing or even by a location, they can be passed down from generation to generation or given like a secret gift from friend to friend. This came from Malaysia, a friend I went to cooking school with. My version is pretty much faithful to the original, though I have doubled it and made a couple of tweaks. When the cakes cook, they separate into two layers; the bottom has a soft texture, almost like lemon curd and the top is like a fluffy souffle. They are really good warm out of the oven, but also hold up ok if they need to be made in advance. The cake shrinks a little when chilled and looks better when still warm or at room temperature. 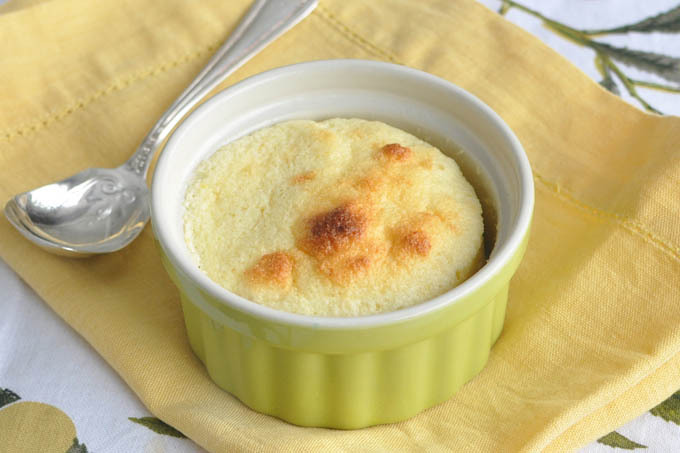 Unlike a souffle, the top does not fall or sink much after coming out of the oven. If serving for a dinner party, I would recommend making it a few hours in advance and not refrigerating. Butter the baking dish or ramekins. You will need a roasting pan large enough to put the baking dish or ramekins inside and add water to make a hot water bath, for baking. Have everything ready! Separate the eggs and put the whites in a bowl large enough to whip them. In a medium sized bowl combine the yolks with the milk, lemon zest and lemon juice. In a large bowl, combine the sugar, flour, and salt. Add the wet mixture (yolks, zest and juice) to the dry mixture and stir until blended. Using a mixer, whip the egg whites (in their separate bowl) until soft peaks form. Fold the whipped egg whites, about 2 cups at a time, into the bowl with the lemon batter until it is all combined. Be careful not to over mix, fold gently, so it doesn't go flat. Spoon the mixture into the prepared pans. For the 6 oz ramekins, I filled them up until about 1/2″ from the top. Bake for about 30-35 minutes or until set. The top will puff up and become golden but the bottom will still be very soft. Remove from the oven and from the roasting pan and set the baking dish on a wire rack to cool for 30 minutes. Best served warm or room temperature. 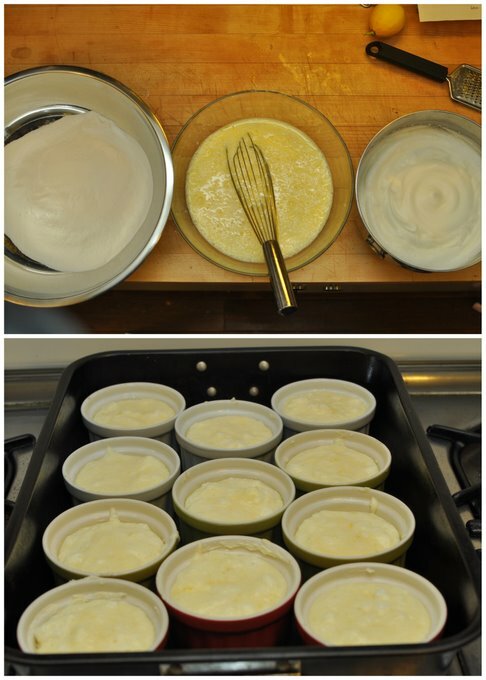 *I made 11, 6 oz ramekins, but it can also be made in a 9′x13″ baking dish, or cut it in half and use an 8″x8″ baking dish. The portions in the ramekins are perfect for individual desserts, but probably were too big for a party, when there were lots of other dessert choices. Because I came from a large family, raised a large family, and there are always friends over, I tend to make more, rather than less. * I almost always make my desserts day of event. That's that inherited sweet tooth of mine, that wants it perfect! Wee Bear and I had a wonderful time in the Pacific Northwest. The sun has been out for a week, and Wee Bear is taking full credit for bringing it up, from the Valley of the Sun. I will be featuring some crafting ideas, that I picked up while at the Ribbon and Button Emporium in Portland, Oregon, in the weeks to come. I will put the crafts together, take pictures, write instruction and post them. I can never miss going to this shop when I am in Portland! Anna is very kind and helpful. She is full of ideas and knowledge. * I will feature a kitchen shop that Wee Bear found in Portland tomorrow! The five bunnies of the Eastside! A four generation picture, including Emma, the pup! You have a peek at the beautiful "Carrot Cake" that Sweet One made for Easter dessert. I will teach you how to properly frost a cake, so it looks like it came from a professional! A final shot before we leave back to the Valley of the Sun. Paul Allen cruising by! Wee Bear says, "It's raining, we're outta here"!